With God in Russia by Walter J. Ciszek, S.J. For several months I had seen his prayer card at our children's school. 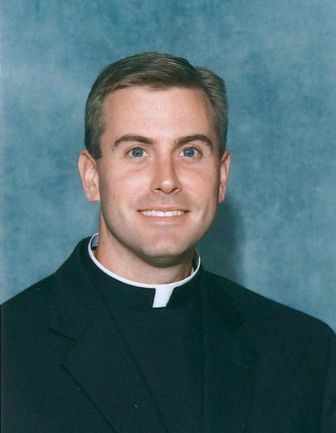 Just a regular looking older priest. Not a saint (yet), not someone famous (yet), but an ordinary looking man on a prayer card. I turned it over to find out who guy was. Fr. Walter Ciszek, S.J., a Jesuit, huh. Then I read Fr. James Martin's book My Life with the Saints. Fr. Martin refers to Fr. Ciszek several times. He talks about his life and his writings. Then at Blessed Trinity parish in Ocala, I found his book With God in Russia . This is often how God speaks to me, in small unnoticiable ways. But third time's a charm, same guy-I had to buy it. Father Walter Ciszek, S.J., tells here the gripping, astounding story of his twenty-three years in Russian prison camps in Siberia, how he was falsely imprisoned as an "American spy", the incredible rigors of daily life as a prisoner, and his extraordinary faith in God and commitment to his priestly vows and vocation. He said Mass under cover, in constant danger of death. He heard confession of hundreds who could have betrayed him; he aided spiritually many who could have gained by exposing him. This is a remarkable story of personal experience. It would be difficult to write fiction that could honestly portray the heroic patience, endurance, fortitude and complete trust in God lived by Fr. Walter Ciszek, S.J. For me, sitting in my comfy bed, reading this book mostly at the end of a warm day in Florida, the contrast of my life and his was extreme. I marveled not only at his deep faith, but his ability to do hard manual labor in the freezing cold year round temperatures of Russia. Although he could not perform the regular duties of a priest throughout the day, he found ways to hear confessions and occasionally say mass. But through it all, Ciszek never stopped praying. We do well to imitate that practice, to pray without ceasing. This book makes World War II and prison camps come alive. To me this is the best way to learn history, through the stories of the real people that actually lived through it. My mother came to our house three days a week from 2000-2005 to help me with the children. When she moved to Florida in August 2000, we had four boys age 8 years-10 months. Our daughters were born in 2001 and 2004. To say she was an enormous help to our family is an understatement. Each day, she would come about 7:30 am. Many times I would still be in bed. Mom had been up since 5am, walked, prayed the rosary with dad, showered, etc and walked in our door full of joy and energy. I would do my best to crawl out of bed. Mom would get the boys to start gathering trash and laundry. Then she would get them breakfast, clean the kitchen and then it was time to "police the yard." Policing the yard means waking around and doing anything that needs to be done; picking up sticks, moving the trash cans, pulling weeds, cleaning up toys around the pool etc. The boys would generally groan when Nana would say in her cheery voice "come on boys, time to police the yard." But she made it fun and they loved to be with her. Kate, age 6 and Mary, age 8-1/2, "policing the yard"
Today Mary, age 8, was helping me pick up sticks from around the yard. When we came in the house she told the boys we had "policed the yard." I hadn't thought of that phrase in several years. But I am glad she said it and even more glad she did it! Gratitude unlocks the fullness of life. It turns what we have into enough and more. It turns denial into acceptance, chaos to order, confusion to clarity. It can turn a meal into a feast, a house into a home, a stranger into a friend. Gratitude makes sense of our past, brings peace for today and vision for tomorrow. ¡Viva Cristo Rey! (Long live Christ the King) were the last words Father Pro uttered before he was executed for being a Catholic priest and serving his flock. Born into a prosperous, devout family in Guadalupe de Zacatecas, he entered the Jesuits in 1911 but three years later fled to Granada, Spain, because of religious persecution in Mexico. He was ordained in Belgium in 1925. He immediately returned to Mexico, where he served a Church forced to go "underground." He celebrated the Eucharist clandestinely and ministered the other sacraments to small groups of Catholics. He and his brother Roberto were arrested on trumped-up charges of attempting to assassinate Mexico's president. Roberto was spared but Miguel was sentenced to face a firing squad on November 23, 1927. His funeral became a public demonstration of faith. He was beatified in 1988. In 1927 when Father Miguel Pro was executed, no one could have predicted that 52 years later the bishop of Rome would visit Mexico, be welcomed by its president and celebrate open-air Masses before thousands of people. Pope John Paul II made additional trips to Mexico in 1990, 1993 and 1999. Those who outlawed the Catholic Church in Mexico did not count on the deeply rooted faith of its people and the willingness of many of them, like Miguel Pro, to die as martyrs. During his homily at the beatification Mass, Pope John Paul II said that Father Pro "is a new glory for the beloved Mexican nation, as well as for the Society of Jesus. His life of sacrificing and intrepid apostolate was always inspired by a tireless evangelizing effort. Neither suffering nor serious illness, neither the exhausting ministerial activity, frequently carried out in difficult and dangerous circumstances, could stifle the radiating and contagious joy which he brought to his life for Christ and which nothing could take away (see John 16:22). Indeed, the deepest root of self-sacrificing surrender for the lowly was his passionate love for Jesus Christ and his ardent desire to be conformed to him, even unto death." 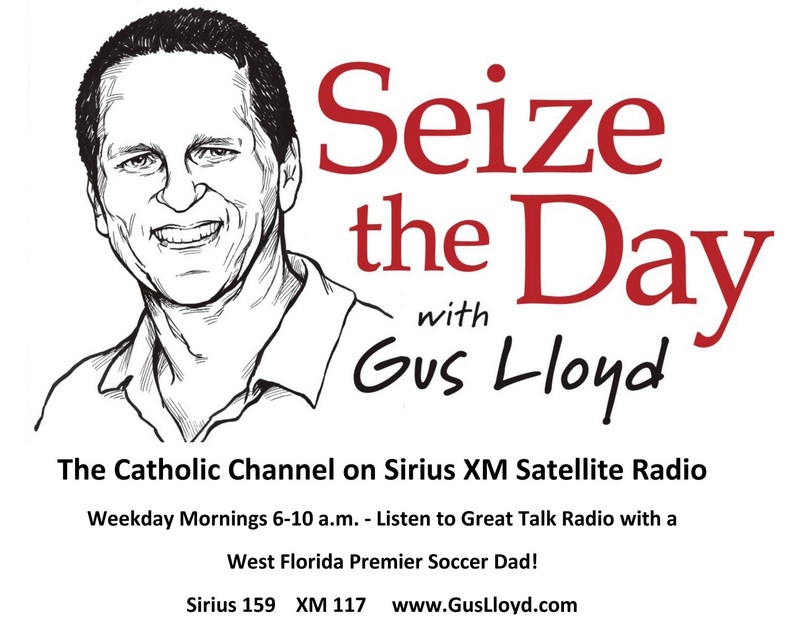 One of the distinct privileges I have working with Lighthouse Catholic Media is to visit many parishes around the Diocese of St. Petersburg and State of Florida. Today I was at Our Lady of Lourdes in Dunedin, FL. The pastor, Fr. Gary Dowsy gave a great homily, reprinted below with his permission. "There has been a lot of royal frenzied activity in Britain since the announcement of the engagement and forthcoming marriage of Prince William and his now fiancée Kate Middleton. You may think that the British are somewhat obsessed by all things royal and you would be somewhat right, though not as much as they were in the past. One media reporter stated that the impending royal occasion diverts attention, if only briefly, from the reality of life in the midst of recession. This comment sparked a discussion on the cost of such an event in the midst of a deep economic downturn that continues to affect us all. The whole concept of monarchy in a country such as the United States, which swept it from its shores in order to claim independence from a foreign power, must seem very odd. It seems to conflict directly with the truth that all of us have been created equally in God’s eyes and that people should not be honored for a title they bear but for who they are. If titles are given to us they should obviously reflect who we are and not be in conflict with the way we live our lives. There is always a danger in placing too much trust in people who bear titles of honour. Our hopes and trust can easily be dashed. Today’s first reading is about Saul’s successor, King David. He was young and handsome and daring. He captured Jerusalem as the royal city. He who once shepherded sheep now shepherded, that is, protected, the people of Israel. David was not a king with a stiff upper lip. He was wild and crazy enough to strip down to his boxers and dance before the Ark of the Covenant. The people loved him. David was a marvelous king who restored God’s people. But he had feet of clay like the rest of us. He was vain, deceitful, crooked and lustful. King David drank too much and had affairs with married women. If he lived today he would rival the antics of the British royal family (God forgive me Your Majesty the Queen for such a comment!) and, no doubt, appear on the cover of People magazine. One thousand years later, when Jesus, the one who called himself the Good Shepherd, rode into Jerusalem on a donkey, they greeted him as royalty by waving palms and crying out hosannas and calling him the Son of David because like David, Jesus was a shepherd king until the end. But unlike David, this King was without sin and restored all of God’s people, not the few, but the many, not one nation but every nation with the gift of salvation. 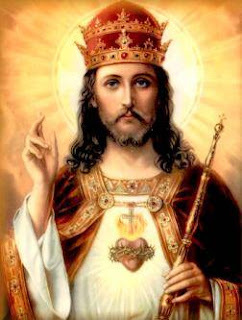 This feast of Christ the King, which closes the Church’s liturgical year, was instituted only eighty five years ago by Pope Pius XI on December 11th, 1925. Pope Pius was having to deal with a global leadership problem that needed a Gospel solution. It was the time of the rise of dictators. The world had seen Lenin take over Russia and was watching Stalin soar to power. Hitler’s popularity was growing in Germany and Mussolini had already ruled Italy for three years. The sovereignty of Christ was being challenged and replaced by the rise of secularism and communism. People were being forced, coerced, and manipulated to place their trust in the sovereignty of certain individuals rather than that of the King of Kings and Lord of Lords, the One who is the image of the invisible God, our Savior Jesus Christ. It is amazing how quickly we can be swayed by strong, charismatic, personalities with feet of clay and hearts of stone, in rejecting the values of the true and everlasting kingdom. How fickle we are, persuaded by the last argument rather than remaining steadfast in the truth and values of the Kingdom of God. Jesus was very direct in his conversation with Pilate when he said that his kingdom was not of this world. It was out of this world, it turns the values of this world upside down and inside out. Jesus had no standing army but he did have followers. He wore no crown of gold, but one of thorns. He did not use his authority to take life but to give it. He did not set boundaries or entertain only the nobility; he welcomed prostitutes, tax collectors, foreigners and thieves. He did not exploit people but spoke sympathetically of widows, prodigals, Samaritans and the poor. He did not wield the sword of punishment but extended mercy and forgiveness: “Today you will be with me in paradise.” He did not coerce; he invited, and rather than tax his subjects to pay the debts of his monarchy, he laid down his own life so that the “debt” of human sin would be forgiven. He did not come to conquer but to save. His throne is not made of gold and precious stones but wood and nails. His throne was cast from a tree and made into a cross. This is Christ, our King, to whom we give all glory, honor and praise. This truly is the image of the invisible God. The Kingship of Christ does not remove us from reality but makes us face it head on. The throne of Jesus, the Cross, confronts us with so many of the struggles and challenges of today’s world: humility, suffering, death, injustice, torture. All that is destructive of our humanity, of our equality as sons and daughters of God, is embraced on this throne of glory and redeemed by our loving God. What an amazing promise is given to the criminal who hangs next to Christ, a promise we would all hope to hear as we prepare to die: “Today you will be with me in Paradise.” This proves that it is never too late to be rescued by God and forgiven. In taking his last breath this criminal was born into eternal life. As Jesus reigns from the cross he teaches us the values that matter, the values that have a lasting consequence: reconciling love, justice, forgiveness and the kingdom of heaven. As we celebrate this beautiful feast, and conclude the Church’s year, let the values of Christ’s Kingdom continue to permeate our hearts and change our lives. Only the values of Christ’s Kingdom can direct us into eternity. No earthly ruler must ever be allowed to have dominion over our hearts for this is where Christ alone must reign. To Him be honor and glory forever and ever, Amen." This Sunday November 21 is the Feast of Christ the King. This is the last Sunday of the Church Year. Advent starts the new liturgical year and begins Sunday November 28. Each liturgical year in the Church focuses on a particular gospel. We just are leaving the year “C” which focused on the gospel of St. Luke and are entering into year “A” which will focus on the gospel of St. Matthew. Pope Benedict XVI has said that Christ's kingship is based on loving and serving others. The feast day was established by Pope Pius XI in 1925. The Feast of Christ the King is very special to me. About 12 years ago, when I first started listening to talks by Scott and Kimberly Hahn, they often mentioned "the Lordship of Jesus Christ." As protestants, they were convicted that Jesus must be Lord of all, if He is to be at all. That means Lord overyour time, Lord over our money, Lord over our heart, mind and soul and all our actions too. This feast celebrates that Lordship. And I pray, that I turn over every aspect of my life, more and more completely to Jesus who is completely trustworthy. Congratulations to Fr. David Toups who is being installed as Pastor at Christ the King Catholic Church in Tampa, FL on the Solemnity of Christ the King. Bishop Robert N. Lynch will preside at the installation mass at 9 am. I got a chance to read through a great blog today and this prayer really hit me. It is similar to the humility prayer. Hope it blesses you on your walk with the Lord today. Father, I am so full of myself. This must not be the way. 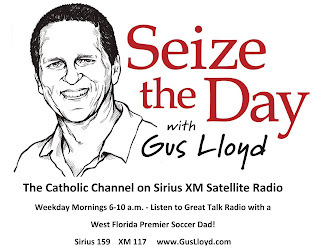 Gus Lloyd is the radio host of the morning show "Seize the Day" on the Catholic Channel, Sirius 159 and XM 117. Visit http://guslloyd.com/blog/ for more about Gus. "By your perseverance you will secure your lives." The last sentence from today's gospel (Luke 21:19) gives us a lot of hope after the predictions of great natural disasters and human betrayal. In his homily for today, Fr. Eric Peters, pastor of St. Elizabeth Ann Seton Catholic Church in Citrus Springs,FL reminded us that through all the trials we may have to face, Jesus has gone before us to show us the way. Since Jesus has been persecuted, handed over, imprisoned and led before kings and governors, we too may have to follow. But we can do so in His strength and with His promise to give us wisdom in speaking. Fr. Eric rightly pointed out to us that these conditions that we live in today are just the right conditions to make us saints. And that is the goal, that we become saints. As a follow up to this Sunday's gospel, next weekend we celebrate the feast of Christ the King. Holy Mother Church reminds us as we close the liturgical year that Christ is the King and has dominion over us and the whole world. Let us persevere then in running the race set before us, with our eyes fixed on Jesus. The birds helped me pray today. I got up early today and had a chance to sit outside on my back porch to say my prayers and read In Conversation with God by Francis Fernandez. As I looked at my neighbor's sailboat, I noticed all the birds were flying around and landing on the wires that the sails run on. They look like little black dots in this picture. The image of the early morning birds brought to mind the above quote from St. Matthew's gospel. God takes care of the birds, he is taking care of me and the birds are my teachers for today! November 5, My husband and I began the 33 days towards re-consecration to Jesus through Mary by St. Louis de Montfort. We had originally done it in 1997 or 1998. 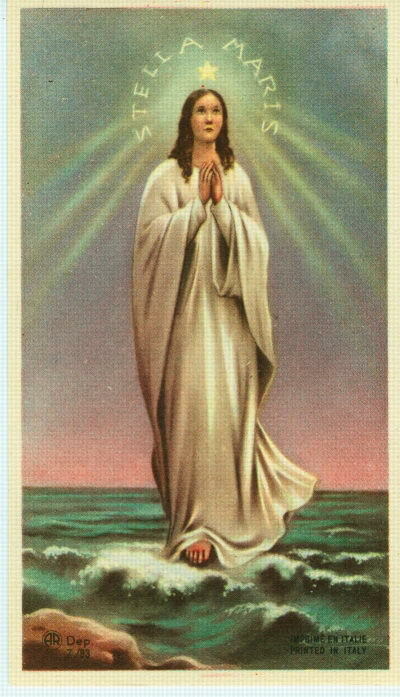 One of the daily prayers for the first 12 days is the Ave Maris Stella. Ave Maris Stella is the Latin for the first line of the prayer. Because the prayer rhymes, it was amazing to me how my children and I had remembered parts of it from over 10 years ago. The children aren't doing the entire consecration with us, but I have been saying the prayer with them at night and they have learned it by heart so quickly! So I share it in hopes that some adopt it as a bedtime prayer or just a great prayer to say after meals, in the car or anywhere. I highly recommend the St. Louis de Montfort consecration. Pope John Paul II calls it one of the turning points of his life. Ever sinless Virgin, Gate of heavenly rest. Peace confirm within us, Changing Eva's name. All our ills expelling, Every bliss implore. Born for us thy Infant, Hear our prayers through thine. Freed from guilt, preserve us, Pure and undefiled. Till we find in Jesus, Joy forevermore. Father, Son and Spirit, One same glory be. Amen. As a teenager, before we were engaged, I used to visit my future husband and his family at their house on Indian Lake. Bob's dad loved to get up early and cook a big breakfast: sausage biscuits and gravy, pancakes, eggs and more. He was always cooking up something and delighted in trying to make exactly what each person liked. All the family gathered round to partake of the yummy meal. For years now, Bob has taken up the breakfast torch from his dad. Almost every weekend, Bob gets up early and makes "big breakfast" for me and all the kids. Often he makes sausage gravy, sometimes Eggs Benedict, many mornings of pancakes or waffles. But last night, he got inspired watching the Food Channel and this morning he out did himself making his own version of "man vs. food." The chef's special was a sausage patty with cheese, topped by two fried eggs, hash browns, four slices of bacon and fried onion rings. All on a "sandwich" of 2 waffles. John, 16 and Joey, 13 took the challenge. They loved it. How thankful we are to Bob for slaving over a hot stove (and griddle and fryer!) And how thankful we are to Bob's dad who gave such a great example to his son. Bob's dad died 3 years ago, but I felt him present in our kitchen today. As the readings from mass today clearly tell us, those who have died in Christ are alive more than ever. Through Christ we all are united forever. Amen! Matthew Kelly gave a full day conference at Blessed Trinity Catholic Church in Ocala today. Matthew's overriding theme is encouraging everyone to 'become the best version of themselves.' In becoming the best version of ourselves, we become the authentic self, the self that God created us to be. And in doing so, we become holy. His 12 state tour spanning 9 months is called "Passion and Purpose." His opening question was "What is it that makes some people live with Passion and Purpose while others don't?" He suggests that people that live with passion and purpose have clarity. Clarity is found only in silence. Most of us live in very noisy worlds from the moment we wake up until we pass out at the end of the day. So, let's all step into "the classroom of silence." For me, that is best done in front of the Blessed Sacrament. Hope to see you there! "Fr. Solanus Casey, Capuchin Franciscan, was born Bernard Francis Casey on November 25, 1870 on a farm near Oak Grove, Wisconsin. He was the sixth child in a family of ten boys and six girls born to Irish immigrant parents. Bernard left the farm to work throughout Wisconsin and Minnesota as a logger, hospital orderly, street car operator, and prison guard. At the age of 21 Bernard entered St. Francis High School Seminary in Milwaukee to study for the diocesan priesthood. Five years later he contemplated a religious order. Invested in the Capuchin Order at Detroit in 1897, he received the religious name of Solanus. After his ordination in 1904, Fr. Solanus spent 20 years in New York, Harlem, and Yonkers. In 1924 he was assigned to St. Bonaventure Monastery in Detroit where he worked for 20 years. Fr. Solanus spent his life in the service of people. At the monastery door as porter he met thousands of people from every age and walk of life and earned recognition as "The Doorkeeper." He was always ready to listen to anyone at any time, day or night. During his final illness, he remarked, "I'm offering my suffering that all might be one. If only I could see the conversion of the whole world." His last conscious act was sitting up in bed and saying, "I give my soul to Jesus Christ." He died at the age of 86 on July 31, 1957 at the same day and hour of his First Holy Mass 53 years earlier. 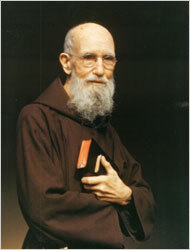 The Servant of God Solanus Casey was named Venerable on July 11, 1995 by Pope John Paul II. With the support of the Guild, the Cause is currently pursuing the stage of “Blessed” (beatification) for Venerable Solanus. " Growing up in Dayton, Ohio, St. Charles was the neighboring Catholic Parish. So "St. Charles" was just a name to me, like the property on the monopoly board. But the patron of that Parish was an amazing man who packed more into 46 years of life than many other who live twice as long. He was a lawyer at age 21, cardinal-deacon and administrator of the Archdiocese of Milan at 22 and ordained to the priesthood at 25, (it didn't hurt that his uncle was Pope Pius IV.) He was instrumental in the Council of Trent (the Catholic Church's response to the protestant reformation) and establishing the seminary system for training young men to become priests. Charles took the initiative in giving good example. He allotted most of his income to charity, forbade himself all luxury and imposed severe penances upon himself. He sacrificed wealth, high honors, esteem and influence to become poor. During the plague and famine of 1576 he tried to feed 60,000 to 70,000 people daily. To do this he borrowed large sums of money that required years to repay. When the civil authorities fled at the height of the plague, he stayed in the city, where he ministered to the sick and the dying, helping those in want. Work and the heavy burdens of his high office began to affect his health. He died at the age of 46, in 1584. I marvel not only at his accomplishments, but at his "yes" to God in service to the Divine Will. 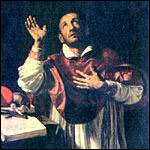 St. Charles Borromeo, Pray For Us! 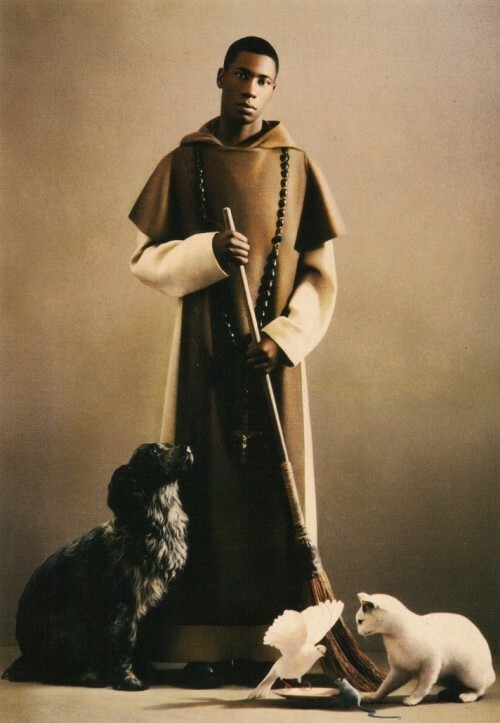 I first learned about St. Martin de Porres by reading about him in a Children's book by Mary Fabyan Wyndeatt . He was born in Lima, Peru in 1579, the illegitimate son of a white Spanish Father and a black freed woman. He lived with his mother and was very poor. He studied medicine as a teenager and then joined the Dominicans, professing vows as a lay brother in 1603. At the monastery, he was placed in charge of the infirmary, where he nursed the sick. He cared for all with tender love. He gave food to all who needed it. He had a special love of the animals and seemed to be able to communicate with them. He was able to bilocate, but this gift was only used in service to God and people. What this saint shows me is that our background and beginnings do not dictate what we may become as children of God. God has wonderful plans for each of us. He uses our background, our interests and our desires and gives us opportunity for growth. He calls each of us to serve His church in a particular way. St. Martin died in 1639. 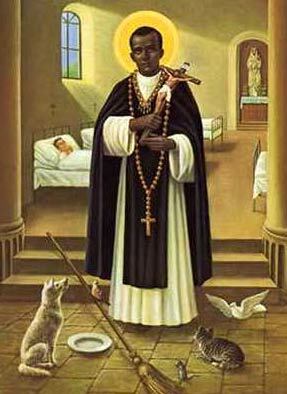 St. Martin de Porres, Ora Pro Nobis. "But the souls of the just are in the hand of God, and no torment shall touch them. They seemed, in the view of the foolish, to be dead; and their passing away was thought an affliction and their going forth from us, utter destruction. But they are in peace. For if before men, indeed, they be punished, yet is their hope full of immortality; Chastised a little, they shall be greatly blessed, because God tried them and found them worthy of himself. As gold in the furnace, he proved them, and as sacrificial offerings he took them to himself." This is a picture of my beautiful mother. She died June 12, 2006 at the age of 64. She has always been a constant rudder in my life. Thanks be to God that I can know with certainty that her prayers are still made on my behalf. As part of the Church Militant, we pray for all the souls in purgatory. We ask for all the prayers of the Saints in heaven. 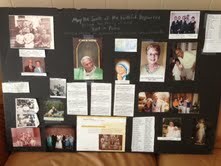 How blessed we are to be part of the communion of Saints!